Food labels claiming that a product is “low carb,” “low fat,” or “all natural,” can not only be confusing but also deceptive. Many times manufacturers compensate for the nutrient they’re taking out of a product by putting another ingredient in, such as replacing the fat in a “low fat” food with additional sugar to make it taste better. Many times, the overall calories in a low fat or carbohydrate product (the part that matters when controlling weight gain) are the same or could even be higher than the original product. Some claims can be easily misinterpreted, such as “Light” olive oil, which is only lighter in color, not in calorie content. Calories: It’s good to know what label claims actually mean when it comes to calorie content. If a label says “calorie free,” this means that the food has less than five calories per serving. Low calorie has less than 40 calories per serving, and “light” or “lite” has 1/3 fewer calories or ½ the fat of the original product. Be careful, though, because if the original product had lots of calories, the “light” version might not necessarily be low in calories. 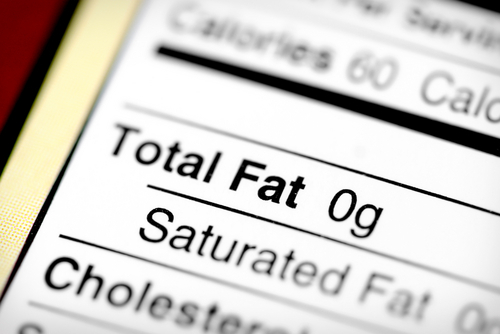 Fat: The total fat in a product should be five grams or less and saturated fat should be three grams or less. Labels that say a product is “fat free” means it has less than ½ a gram of fat per serving and “low fat” means less than 3 grams per serving. Remember- a label stating “reduced fat” may not mean low fat, just 25% less fat than the original version. Look out for the words “partially hydrogenated” in the ingredients list as this means you’ll be getting some trans fat (the worst kind of fat which should be avoided) even if the nutrition facts panel says zero grams of trans fats. Also try to keep cholesterol to 100 mg or less. Fiber: Look for more than two grams of fiber per serving. Foods that are “high fiber” contain more than five grams per serving. You should aim to get at least 25 grams of fiber a day. Look for the word “whole” in one of the first three ingredients of a grain product as this means that it’s made of mostly healthy whole grains. Sodium: Look for less than 200 mg per serving to stay below the maximum recommended amount of 2300 mg per day. A “sodium free” product means that is has less than five mg of sodium, while a “light in sodium” label means the product has ½ the amount of sodium in the original product. Remember to read the label- a “light” sodium product could still have more than 200 mg per serving if the original version had more than 400 mg of sodium to begin with! Sugar: Look for 12 grams or less per serving. Sugar free means a food has less than five grams of table sugar, honey, corn sweetener, or other sweeteners. No sugar added means there are no sugars added during processing, though there still may be natural sugars in the product. Reduced sugar or less sugar means there is 25% less sugars than a similar food.